Once again, we have proof that the Chariot is one of the best inventions ever. It would be fun to run a company like Chariot Carriers. It is a cool product that people like and value, unlike some of the screws, nuts, and bolts and other hardware that Horst Engineering makes for a living. Not that bolts aren’t important, they are just anonymous and the customers would rather manage spreadsheets than research good products. I wish I had come up with the design for the Chariot! I’m not quite sure how the Livingston Family would function without one of these. And now, we have two! We acquired our CX-2 last month after the arrival of our second child. I’ve raved about the CX-1 and now I’m just as happy with the CX-2. This isn’t an advertisement, it is an endorsement. If you have young kids and you want to remain active, there is no other option. We got the “deuce,” as it is known in our house, out on the Hop River Linear Park (Rail Trail) for a little walk this morning. The snow wasn’t as deep as predicted, but it was deep enough. They don’t make a CX-3, so it looks like this is our last Chariot! Our Chariot CX-1 is one of the best purchases Deb and I have ever made. It is an amazingly well engineered product and has been a savior for keeping us active over the past ten months. Our little guy just loves the thing. Today, I got to use it in two of it’s modes: running and cycling. We take it everywhere with us. 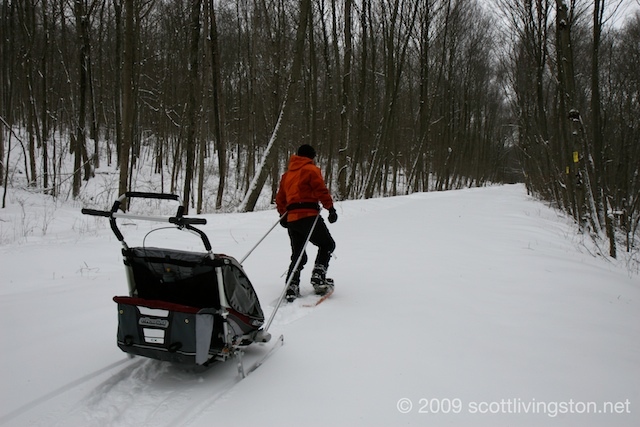 We push it, pull it, run with it, bike with it…we have even snowshoed with it by replacing the wheels with skis. Kudos to Chariot Carriers Inc. of Canada. Our Christmas morning tradition is to spend time with our friends from the local running community while supporting the Cornerstone Foundation by running the Scrooge Scramble 5K. We returned to Rockville, Connecticut for the 13th time. Most of them have been with our kids. We used to push them in the Chariot, but now, they run on their own. This wonderful fundraiser drew a nice crowd on a sunny morning. Like last year, we did a modified six loop course in downtown Rockville that started and finished in front of the shelter. It was cold and breezy, but as I mentioned, the sun shone brightly. Spirits were high. Shepard and I pushed the pace while Debbie ran with Dahlia. They pushed the pace too! Shepard finished one lap early by mistake, but he went back out and did his sixth lap after realizing that he beat me and that shouldn’t have been. The results aren’t sorted out yet, but we will send them a note. I hadn’t run hard in a very long time, so this was a fun, but rude awakening. My legs will pay the price for running hard on pavement. It’s good to see that after nearly a full year, I’m feeling good again. The running form will come if I put some time into it. Right now, I’m relying on my cycling fitness, which is pretty good. In conclusion, this was a lot of fun for a good cause and the volunteers and sponsors, including Platt Systems (timing) deserve a lot of credit for keeping this race going. It wouldn’t be Christmas in the Livingston household if we didn’t run the Scrooge Scramble. This was the 12th time in 13 years that Debbie and I have done this race on Christmas morning. We started doing it as a couple, then we transitioned to pushing the kid (or kids) in the jog stroller (Chariot), and now they run it with us. This was my 50th (and probably last) race of the year. Today’s 27th edition was slightly modified due to the snowstorm. The heaviest snow fell overnight and early in the morning, but it was still snowing lightly during the race. Three or four inches fell in total. 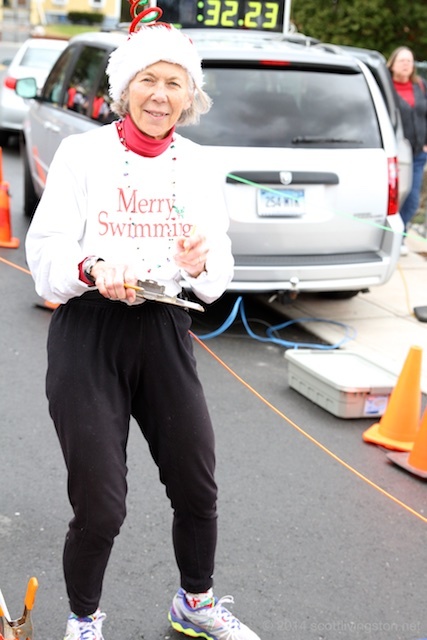 Longtime Race Directors, Janit Romayko and Mary Lou White did their best to coordinate today’s race and adjust for the conditions. The start was pushed back 30 minutes to 11:00 A.M., to accommodate folks who were delayed by the weather. The numbers were down from the 200+ runners in 2016, but we still had a good turnout, and the donations will still have a positive impact on the The Cornerstone Foundation, which operates the community shelter/soup kitchen that doubles as the start/finish line. 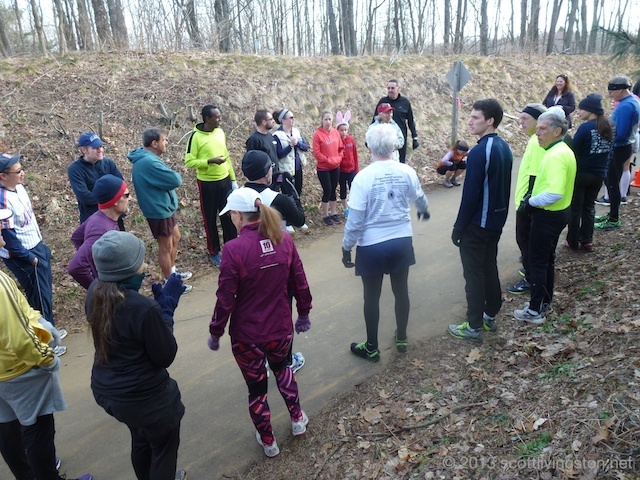 Another change was that the normal out and back course was modified to be a 1/2 mile loop around Rockville’s Talcott Park. We heard that the neighboring town of Ellington wouldn’t permit us to run the normal route into their town, and back, due to the snow. Before the race, I joined Bruce Christensen and a few other runners in a shovel brigade. We cleaned up the snow and ice on the most slippery corners. We ran the loop six times to get the 5 kilometers. The race was about 1/10th of a mile long. 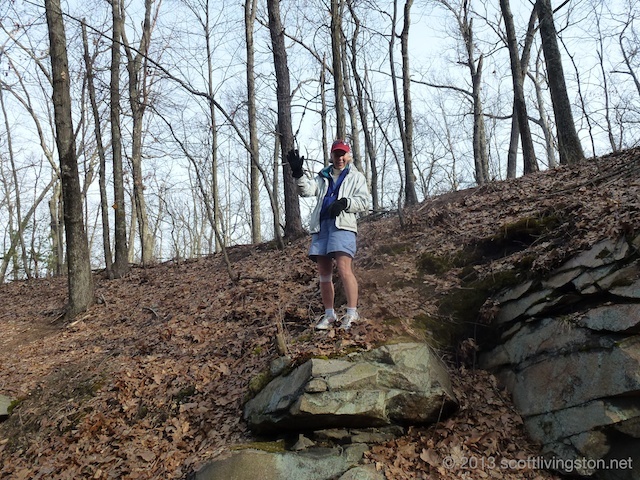 On the way to Rockville, we dropped Debbie off on the rail trail so that she could do a little workout. This is always part of the tradition. The kids and I registered (there is no fee but donations are welcome), and then mingled with many of our friends from the Silk City Striders and Shenipsit Striders. Shepard had another fine run. It won’t be long before I’m chasing him. Dahlia and Debbie ran together and got a big ovation at the finish. One more snow squall hit as we were leaving Rockville for home, but as we came into Bolton, the sun burst through the clouds, reflecting off the beautiful snow. It has been a great day already. This morning I did Bobby’s Run for the second time. 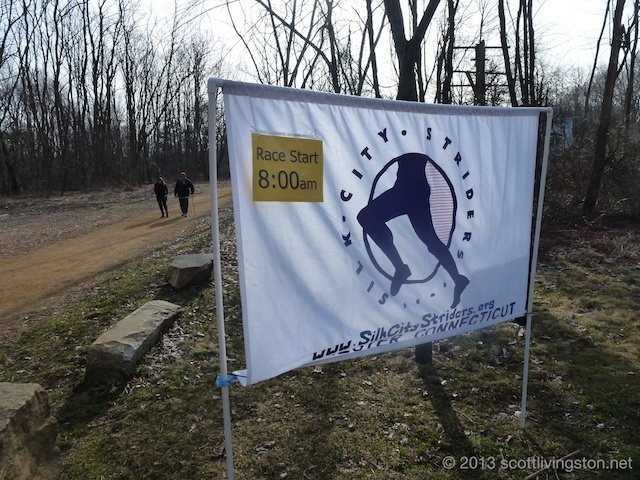 Hosted by one of my favorite running clubs, the Silk City Striders, this eight mile race on a mix of rolling roads (including three miles of dirt). The loop around Snipsic (Shenipsit) Lake is lovely. I last ran this race in 2010, which was a banner sporting year for me. I was in the best shape of my life. That day, I pushed our Chariot CX-2 with both of our kids and finished in 53:30. Today, without the stroller, and five years older, I ran 51:05, which is not that much faster given the handicap I had with the stroller. Even still, I really enjoyed this morning’s run, which was the 12th year for the race. I didn’t remember that the race was today until scrolling through my Facebook feed last night. Race Director, Bekkie Wright, posted about the race and I thought it would be a fun way to get in a workout and improve my running fitness. Bekkie and her partner, Joe Poliquin with help from several volunteers deserve credit for keeping this race going in Bob Bonadies’ memory. The low-key event wouldn’t happen without them and I’m glad they were issuing numbers, marshaling corners, manning aid stations, and taking photos. Tomorrow is the Soapstone Mountain Trail Races. Soapstone always follows Bobby’s Run. 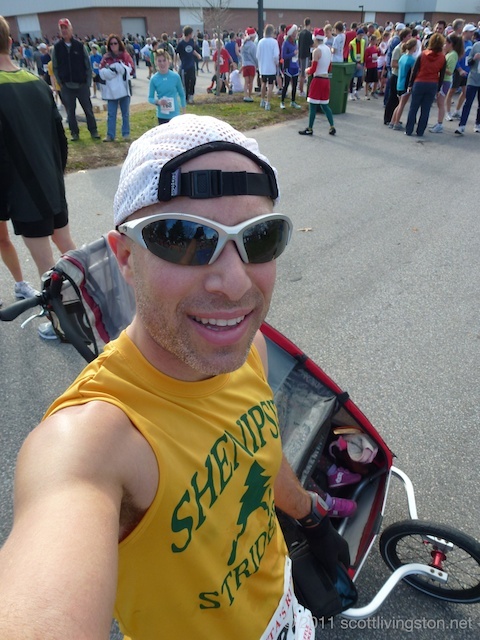 I’m looking forward to a great day with my other favorite running club, the Shenipsit Striders. This year’s Bolton Road Race was bigger than ever. It’s a great hometown race that has grown dramatically during the past three years under the stewardship of Dani and Ned Kennedy. The Kennedy’s with support from Bolton High School Track & Field, the Bolton Booster Club, and a cadre of volunteers have done a great job reviving this classic 5-miler. Horst Engineering is proud to be a repeat sponsor of the race. All four Livingston’s competed. 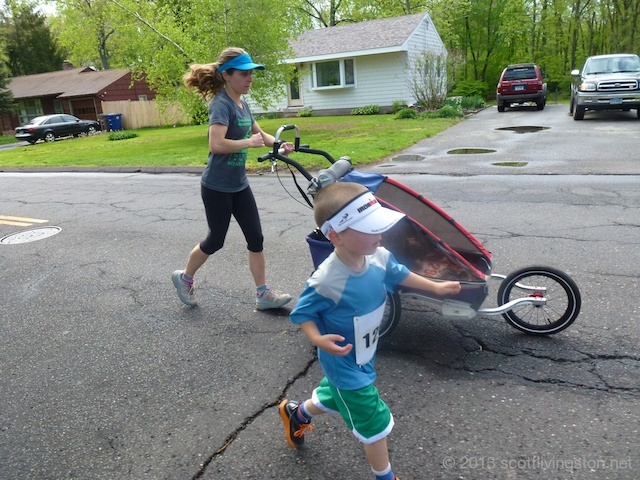 Debbie pushed our daughter in our Chariot CX-1 jog stroller while I ran with our son. It was his second year doing this race. Five miles are a bit far for him, but he toughed it out. We are going to miss the stroller when it is retired for good. Fortunately our daughter is “petite” and we still get to push her on occasion. 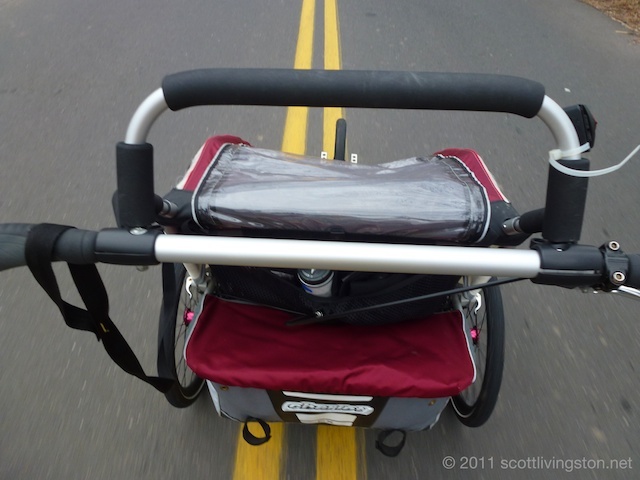 Over the past eight years, we have loved the use of these strollers/trailers. They are awesome inventions and kept us active despite having young children. I took the day off from photography, so I don’t have much to show. I just wanted to enjoy the camaraderie of the running community on a great day. The weather was forecast to be mild, but we ended up having three seasons spread out over five miles. It was cool and cloudy before the start. With two minutes to gun time, it was snowing like crazy. We got hit with a wild and windy squall that was just perfect. That last two miles (all headwind and crosswind) and then it started to clear. By the finish, the sun was peeking out from behind the clouds and the weather warmed up considerably. 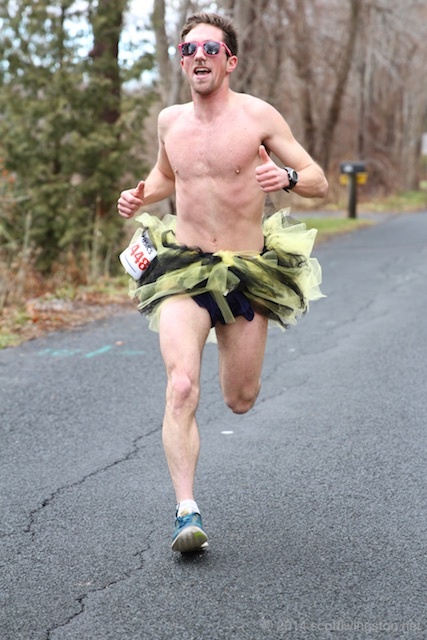 Scott Mindel took the win in a blistering fast 26:47 on a hilly course with a rough road surface. 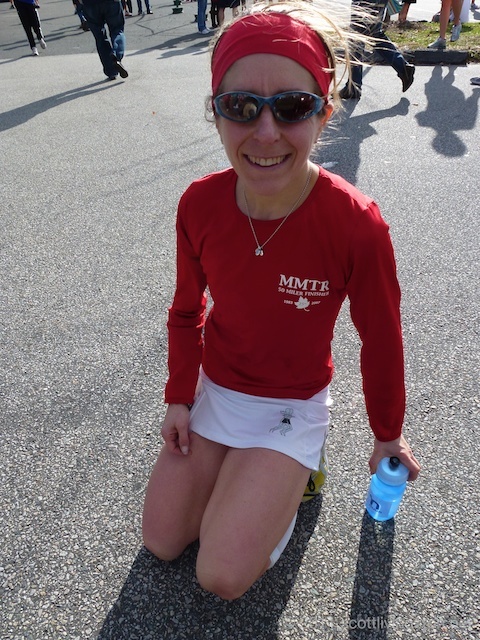 Melissa Stellato was first woman and 9th overall in a equally fast 30:14. She was following up on her impressive third (overall) at the Colchester Half Marathon last week. I love conditions like we had at Bolton. Everyone else appeared to like it too. It was fitting that after a viscous winter, we were still getting hammered by bad weather in mid-March. Thank you to Dani, Ned, the volunteers, and fellow sponsors for supporting the event. Today, our tradition of running the Scrooge Scramble on Christmas continued. It was a wonderfully mild morning after a rainy and windy night. 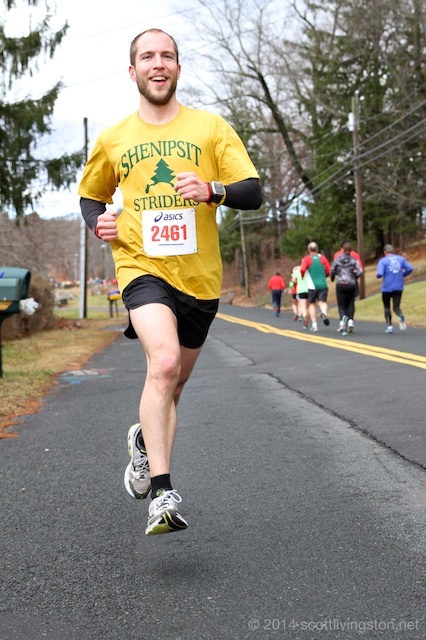 The conditions were much better than last year’s frigid 5K. The field was a bit larger this year, which should mean the contributions (food, clothing, money, etc.) to the Cornerstone Foundation homeless shelter should be significant. I love it when the running community comes together for a fun event, especially one with a great history. Mary Lou White, Janit Romayko, Ken Platt, and the other volunteers that make Scrooge so much fun were all on hand again. This year was the 24th annual event in downtown Rockville. 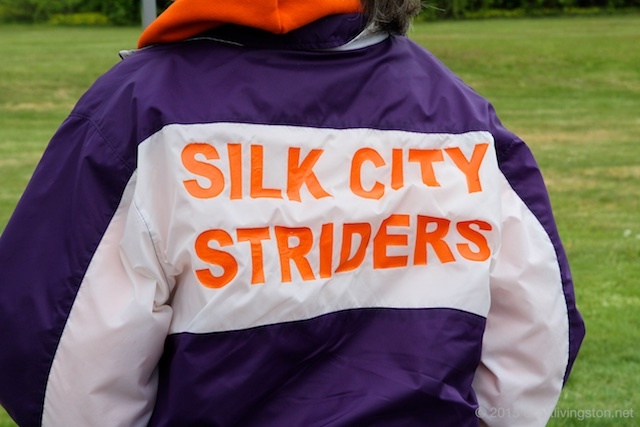 Several of our Silk City Striders and Shenipsit Striders friends were on hand. Our son ran well. Debbie pushed our daughter, who alternated running and riding in the Chariot. We don’t get the jog stroller out nearly as often as we used to, so it was nostalgic. I jogged with Debbie and took photos. My foot is feeling a tad bit better. I last “ran” at the Manchester Road Race and before that, at a triathlon the first week in June. I’m ready to turn the corner and put my injuries in the past. 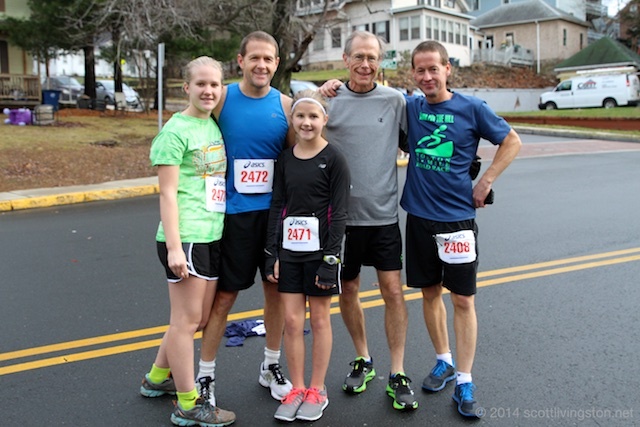 Today the Livingston’s kicked off the 2014 race season at our hometown race. The Bolton Road Race, under the race direction of Dani Kennedy, has seen a nice revival in the past few years. BRR is proof that good marketing and good value can make a big difference for a race. 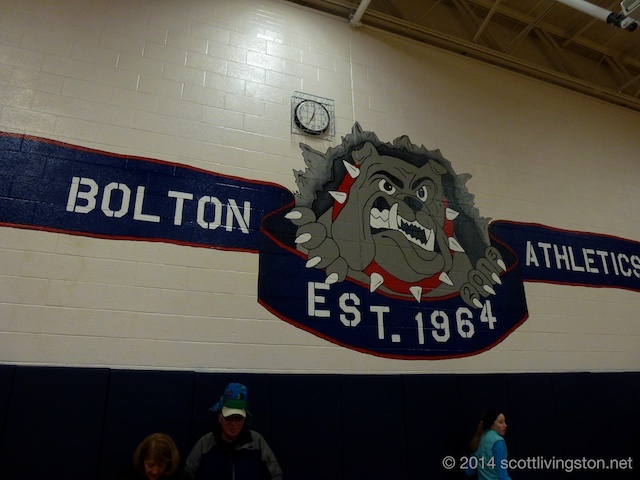 BRR benefits the Bolton High School Boosters Club and the Boys and Girls Track Teams. These “little” races may not draw the fields of larger races with more marketing muscle, but they are more authentic. The BRR is one of those rare 5 mile courses that used to be really popular during the running boom of the 1970’s and 1980’s. The 5 miler is nearly extinct with the proliferation of 5K’s. Today, there was no mud, no obstacles, and no electrified wires. BRR does offer a 5K option, but the 5 miler is the main event with the bonus factor of hills and wind. 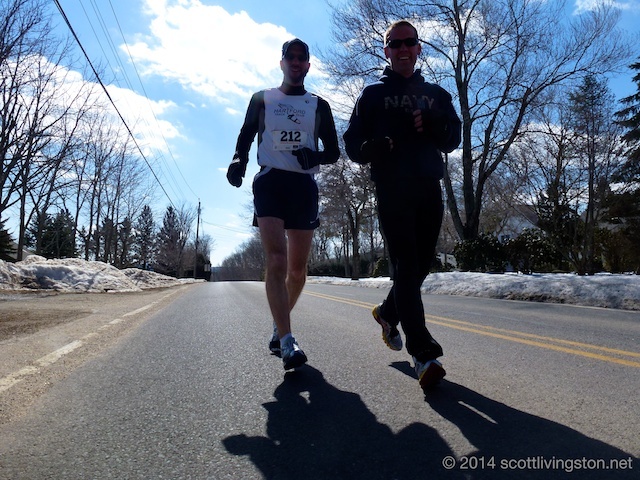 BRR is a good old road race; it’s you versus the course. That’s just how I like it, and when you can jog over to the start/finish from your house, it’s even better. BRR is a true community race, the way they all used to be. Stock in the promotion company isn’t traded on the NASDAQ and there is no private equity investment to fuel the global growth. It’s Dani and her volunteers and in 2014, they raised the bar to yet another level. Dani landed several new sponsors. Full disclosure: Horst Engineering came aboard as one of the sponsors this year. We like to support events that promote healthy living in the communities that we work and live, especially when the proceeds to local causes. BRR has many other sponsors, including: Simoniz, Highland Park Markets, Bolton Physical Therapy, American Ladders & Scaffolds, Bolton Mobil, Bolton Notch Self Storage, Bolton Veterinary Hospital, and Steve Czerwinski, Inc. Another 15 businesses/organizations made contributions. 218 runners finished the 5 miler and 49 finished the 5K. My parents, Stan and Lynn, were kind enough to come out and watch our daughter (though I was prepared to push the Chariot CX-1 like old times) while Debbie, our son, and I ran. 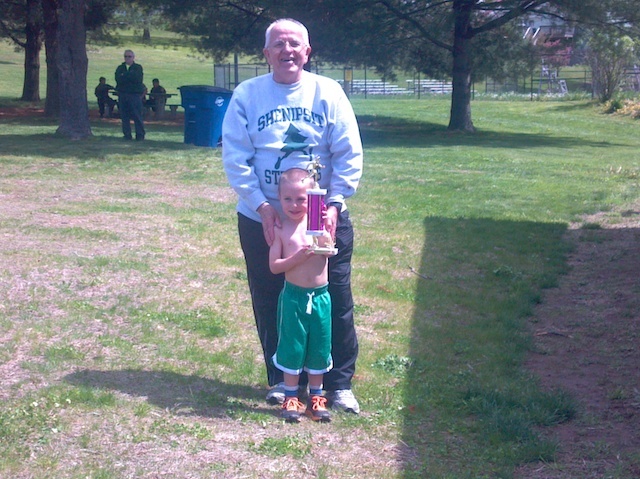 Our son was joined by his favorite running buddy, Uncle Tom Schieffer. 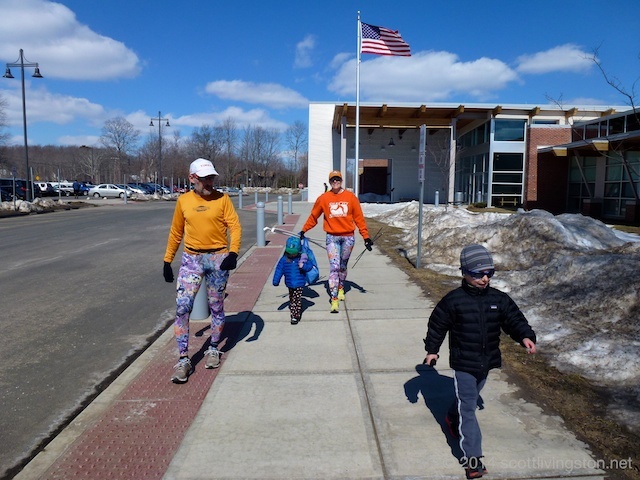 Tom came down from Shelburne Falls, Massachusetts, to spend the afternoon with the clan and get in some outdoor exercise. Debbie and I needed a good workout, and everything worked out as planned. Unfortunately, my schedule didn’t permit the full experience. The minute I crossed the finish line, I grabbed my pack, donned an extra layer, and ran the two miles straight home. I’m disappointed that I missed hanging out with so many friends. I was scanning the results on my iPhone and saw the names of many people who I haven’t seen since last year. My timeline for this Sunday afternoon was a little crazy, but was true to the spirit of Life Adventures. Debbie departs on foot to run up to the high school. I round-up the kids, get them loaded into Debbie’s car, and drive to the school. 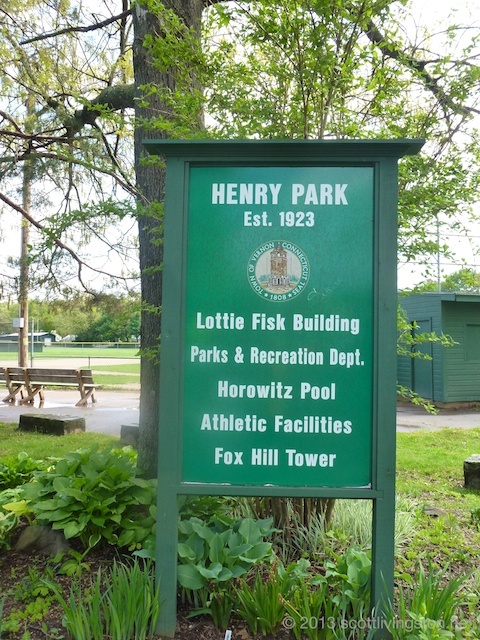 Park, dress, pick up our bib numbers, meet up with parents and Tommy. Two mile warmup with Debbie. She is a little warmer at this point, which is what an ultrarunner who runs 100 milers needs when running 5 milers. The race starts, two minutes early by my watch, and I’m still behind 50 runners. Technically, I didn’t miss the start, but I had some traffic to weave through and it cost me five seconds, which means nothing, but feels good to talk about. I finish, grab my pack, add a layer, take a few photos, and run back home. Tim Cote joined me for the first mile of the route. We chat about making stuff, machining, alloys, his upcoming wedding, 7 Sisters, hills, long winters, Brooklyn, bicycle commuting, Traprock 50K, work, sailboats, and a bunch of other stuff. It’s amazing how much ground you can cover in one mile. I get home, download photos, change, shower, mix a bottle of Vega, upload GPS data, grab half a dark chocolate bar (it had to hold me over until I got to Atlanta), and finish packing. I was planning a 10 minute transition, but ask any of my triathlete friends, I’ve never been good at transitions. I depart for BDL, drink the Vega and eat the chocolate. I ride the LAZ (monopolistic parking evil empire) shuttle to the terminal. I’m berated by TSA officials (along with the other “customers”) even though I know what I’m doing. Yes, I know, nothing in my pockets! I’ve got to look into this TSA Precheck thing. Heck, I just need a G5. I’m in 29C. Sigh. At least it’s an aisle seat. Howard Schultz is on the cover of the in-flight magazine. I bet he has a G5 or equivalent and probably will never read an in-flight magazine! Airborne. Headed for ATL and then TUS and then a Monday drive to Guaymas with a colleague. Horst Engineering de Mexico, here we come. I’ll let you know how my legs feel after a day or two. The .42 ounces of Lightly Salted Peanuts I ate on the first flight should aid my recovery. 12 grams sounds like so much more than .42. Hey, it was only 5 miles. Back in 2008, Debbie and I ran the Six Foot Track Marathon (the rugged trail 28+ miler was also this weekend; that would have been fun), from Katoomba to Jenolan Caves in New South Wales, Australia. We were on a trans-continental flight from Sydney to Los Angeles (with a two-year old) within 15 hours. That was ugly. It took me several months to recover from that foolishness. Anyway, I didn’t realize the BRR was a 1:00 P.M. start when I booked my flights. How many races start after lunch? Anyway, I didn’t run as fast as in the past, but I’m getting older. Debbie hates it when I say that. I had a good run last year in 30:08 when I was 5th. Today, I ran 31:22 for 9th. At least I’m still running. I chased Trevor Chambers and Matt Estes for a while before they both gapped me. The elastic band broke just after the 2 mile mark. 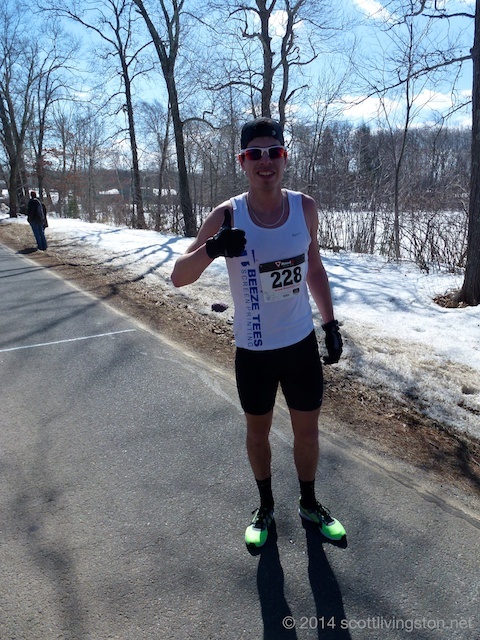 Matt is coming off a stellar road marathon performance and will be one of the runners to beat at Traprock next month. Trevor is a 16-year-old runner on the Bolton High School XC team and is getting faster. He has good pedigree. I often battle on the bike with his dad, Andy, a super strong veteran rider. I hope I’m going as good as Andy in 15 years. With Trevor and Thomas Paquette in front of me, the first Bolton resident division title was out of reach. Debbie had an OK race. She is still in comeback mode, trying different approaches to regain her speed. She was 6th woman and 2nd in her age group. Our son was happy to get second in the under 12 age group in his second 5-miler. 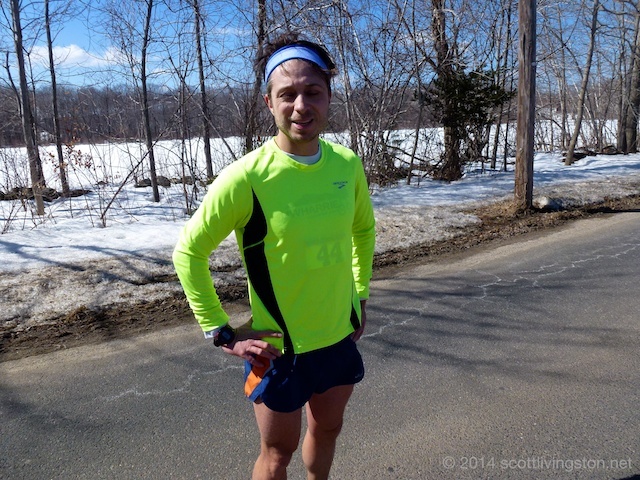 Technically, the Manchester Road Race is 4.748, so this was his first real 5-miler. Paquette was the first overall finisher in a fast 26:57. He was followed by Brian Nelson and then the aforementioned Tim Cote. First woman was Kelly Labanara in 34:30. Caitlin Cunningham was only one second behind her. That would have been a good finish to watch. Alison Caruso was third. 10-year-old Luke Stoeffler won the 5K in 22:10. He was flying! There were lots of good results for an early season race. It’s going to be a good year for many. Keep running! 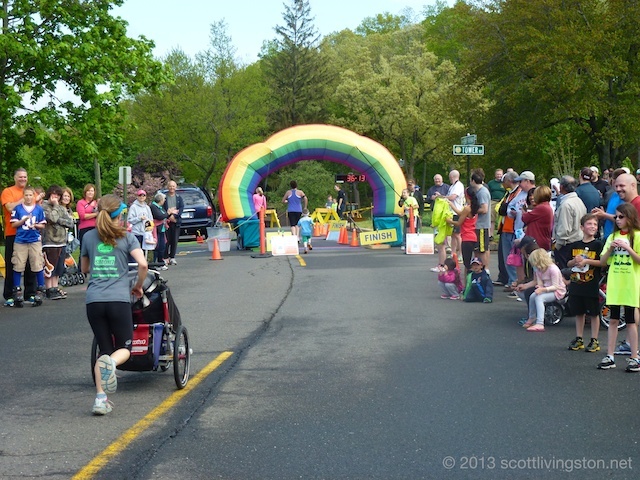 It had been a few years since our family went to the Mother’s Day Dash in Vernon, Connecticut. This is a hometown race that we have done many times. 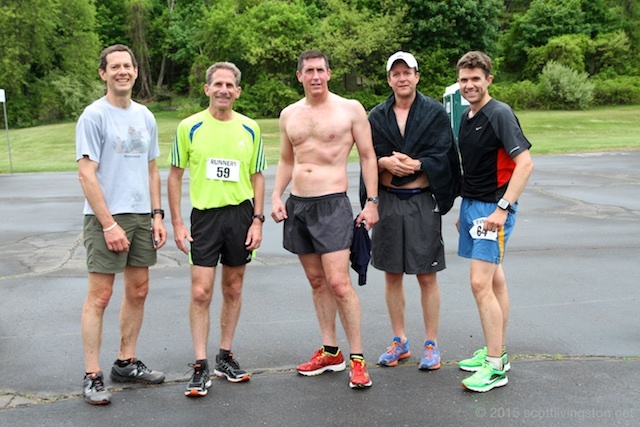 Thanks to Wapack and Back being yesterday instead of today, we had the opportunity to race a 5K in Rockville. Unfortunately, the weather didn’t clear in time for my 45 minute ride to the race from Bolton and I was soaked to the bone when I arrived. I also took a little too long getting ready and arrived only six minutes before the start, and had to work hard to make it with that much time to spare. Debbie and the kids were also late arriving. I changed quickly while they registered us. The national anthem was played, and boom, we were off. Brian Nelson, the fastest guy in Vernon, posted a good time in the high-16’s. He was followed by the speedy masters runner, Brett Stoeffler, who took 1st in my age group in 17:24. I kept Brett in sight and periodically counted the seconds after he made a turn or passed a landmark, but I never gained any ground. I did earn my race fee back in the form of a $20 gift certificate to Rein’s Deli. That was nice! Karina Johnson was the top woman in 19:03 despite running a track race last night. However, the highlight of the day was seeing our six-year old son complete the race without walking a step. I ran back to see them and did the last 1.5 miles alongside. Debbie, showing little muscle soreness after yesterday’s punishing 50 miler, pushed our daughter in the Chariot CX-1, which is increasingly rare but enjoyable. Our son earned the Tom Curtiss award for being the youngest finisher of the race. That was extra special for both his Mom and Dad, and the little runner was stoked. My legs are starting to come around after a less than stellar start to the endurance sports season. At least I held off the 14 year-old and 11 year-old kids. These guys are trying very hard to make a 40 year-old look bad! I put my wet knickers back on and did another 90 minutes on the bike, taking a little longer route home. Mercifully, the rain stopped just before the start of the race and by the end of the awards ceremony, the sun was out. I took some of my favorite roads including Valley Falls Rd. and Spring St. It was nice to see other folks enjoying the improved weather conditions. At the Dash, it was great to see so many friends from Bolton, Vernon, Manchester, Tolland, Ellington, and the surrounding towns. This event is a fixture on the calendar and gets great sponsorship support and has a lot of history. I like the course. It has a little rise in it and the finish is a little kicker too. It’s been a full weekend of running in the Livingston household, which is just fine with the four of us. 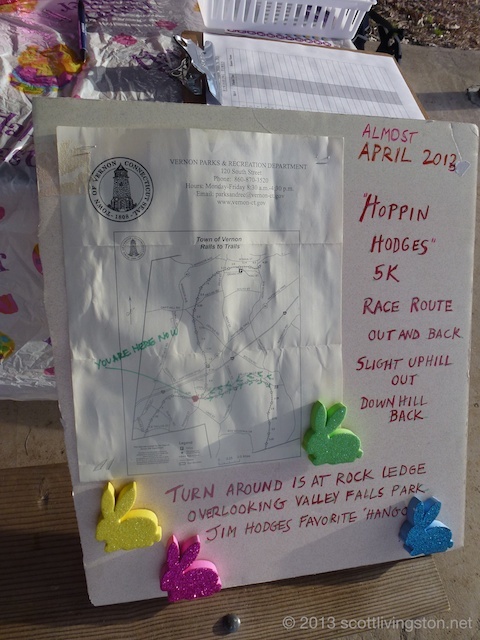 A relatively new Easter tradition continued today at the 2013 Hoppin’ Hodges 5K. My 2012 report has more of the history behind the race, so refer back if you are curious. 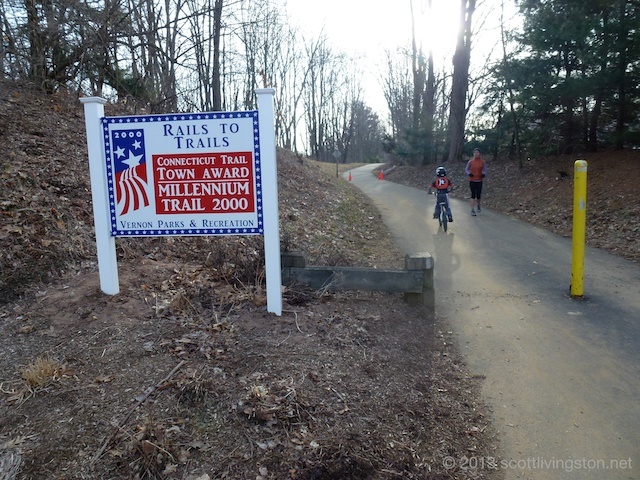 This year, the whole family joined me at the Church Street depot on the Vernon rail trail (Hop River Linear State Park Trail). I rode over to see many of our Silk City Striders friends. Janit Romayko is the race directing force behind this run little “race.” I think the true distance on the out and back course was more like 2.5 miles, but who is counting? I was taking it easy after yesterday’s trail half marathon softened up my legs, so Debbie ran solo and I pushed our little girl in the Chariot CX-1, which brought back a lot of memories. We don’t get that rig out as often anymore. Our son rode along on his bike. Today was the last “race” of the year for me, and it was a fun one. 42 others preceded it. The Scrooge Scramble has become a tradition and a favorite. Today’s 21st edition was extra special. Our six-year old did his first 5K. He runs kid’s cross-country races, cyclocross races, mountain bike races, and mini triathlons, but he really hadn’t run more than a mile until today. Despite a little snow and freezing rain, he was determined, which was very cool. The four of us had a lot of fun bringing up the rear (or close to it) of the 83+/- person field. Debbie pushed our three-eyar old daughter in the stroller. 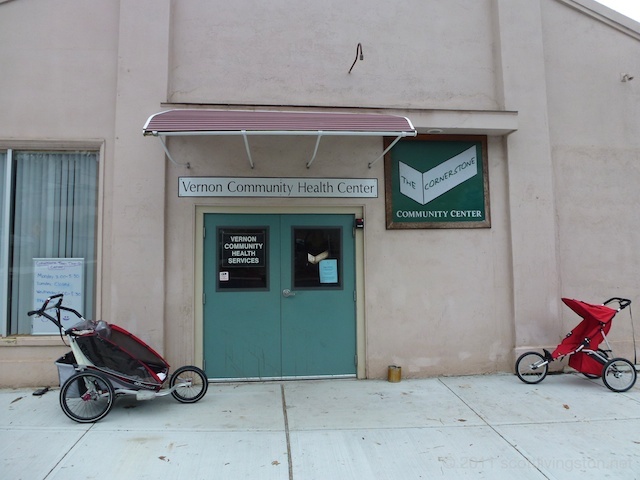 More than $2,100 was raised for The Cornerstone (Vernon Community Health Center) in Rockville, Connecticut. 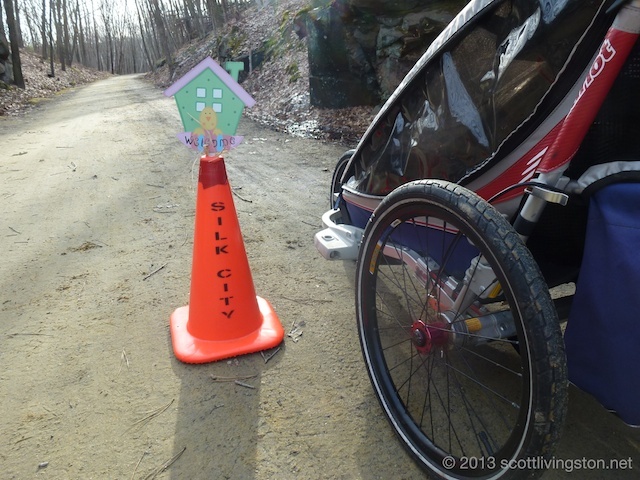 We saw many of our friends from the Shenipsit Striders and Silk City Striders. The days of pushing our little boy in the Chariot are long gone. He said, “I’m too big.” So, he ran instead, which is fine with us. Though next time, we have to remember to bring extra socks. We had extra shoes, but we were missing the socks! 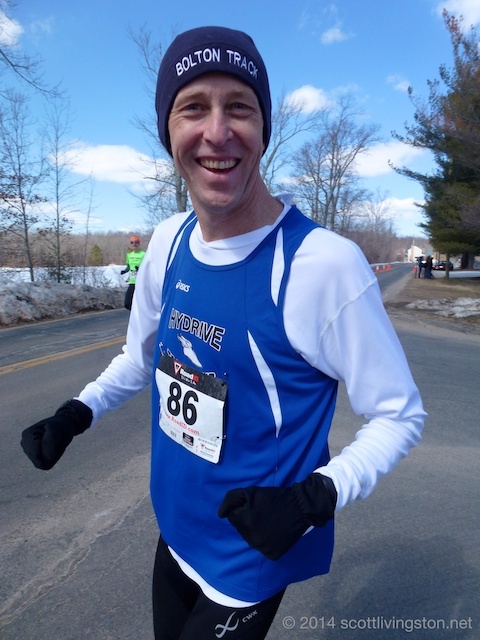 Many thanks to Todd Brown for bringing the 1985 and 1992 Manchester Road Race results with him. He has been traveling to races with them for the past three months, upon my request for help. A few years ago, I started a research project to determine how many Thanksgiving Day MRR’s I’ve run. I was missing several years of results, so I spent an evening at the Manchester library researching old Hartford Courant’s and Journal Inquirer’s on microfilm. I couldn’t locate two years in the archives. Todd came through. I confirmed that I didn’t run the 1992 edition, but I did run 1985, which was my first. My official total is 23, including the last 18 in a row. I had a blast going through the results this afternoon. I recognized so many names. It was amazing to think that this was more than 27 years ago. I had just turned 13, was running cross-country for Vernon Center Middle School and this was my first non-school competitive race. 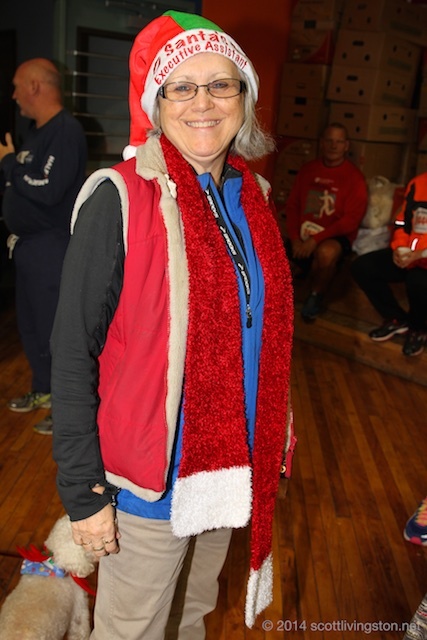 Today’s co-race director, Janit Romayko, was in front of me in the results, and I recognized the names of so many people I know, including several others who ran Scrooge today. Things sort of came full circle for me today. I couldn’t think of a better way to spend a Christmas morning. 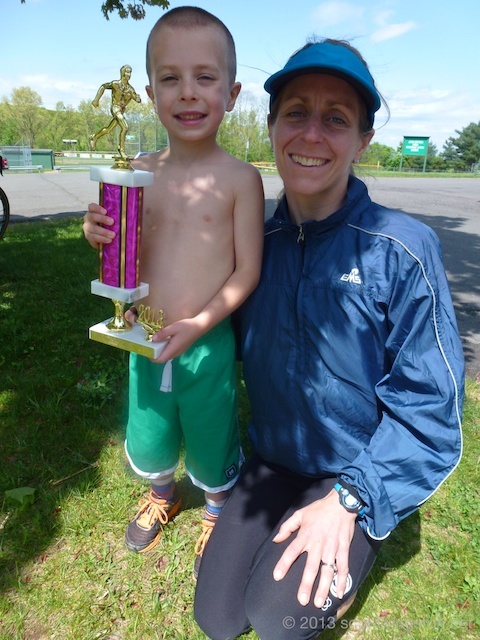 I ran with my family, ran with my son in one of his first road races, and found the results from one of my first races. 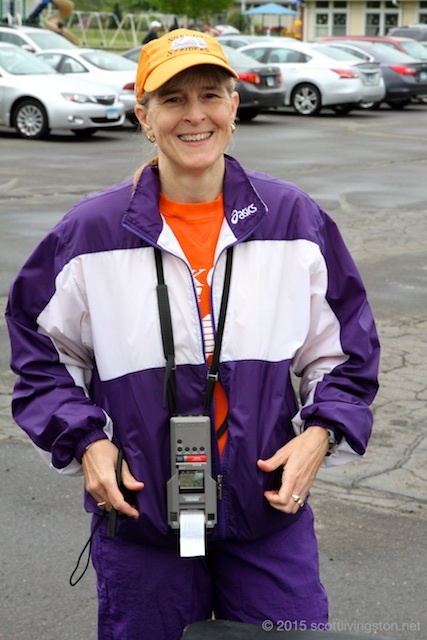 For me, that 1985 Manchester Road Race is more than 800 races ago, and it has been quite an adventure! 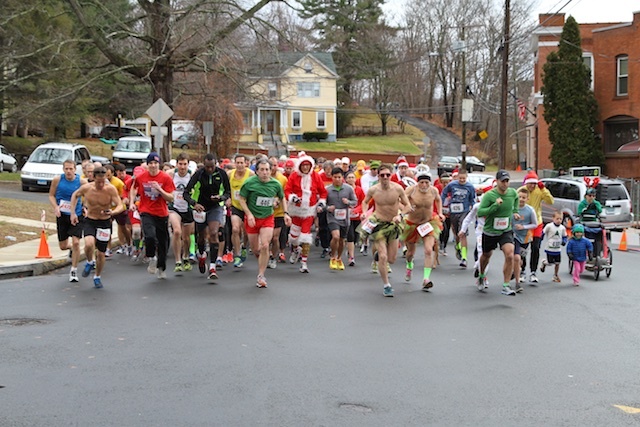 This year’s Scrooge Scramble in Rockville, Connecticut was our 8th in a row. It was a fine Christmas morning that we shared with many of our running friends, and all for a good cause. $2007 was raised for The Cornerstone Soup Kitchen. There were also many food and clothes donations. I’m a sucker for tradition, and this is one that I love. I pushed our Chariot CX-2 loaded up with a couple of happy (and bundled up) children on the 5 kilometer out and back course. It was in the low-20’s Fahrenheit when the race started at 10:30 A.M.
Debbie ran off on her own, apparently, fully recovered from last week’s Lookout Mountain 50 Mile Trail Race. I’m far from recovered. Eight days later, my legs are still blasted from that effort, so I took it really easy. 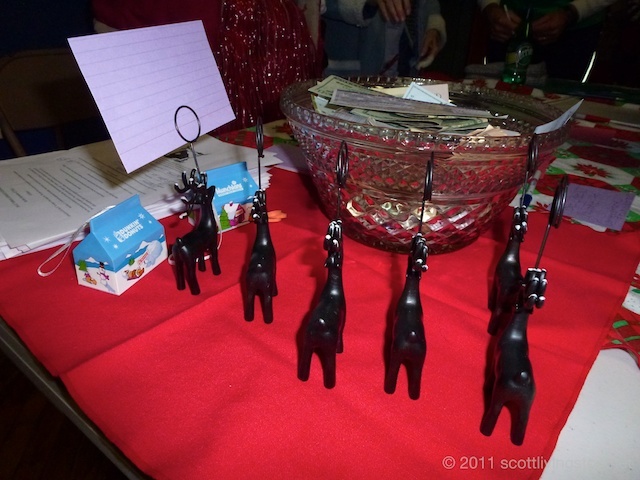 Debbie earned a little reindeer picture holder for her effort, but this event is much more about the cause and camaraderie than the results. Janit Romayko and Mary Lou White are the co-race directors. They time the event, but it is very low-key. 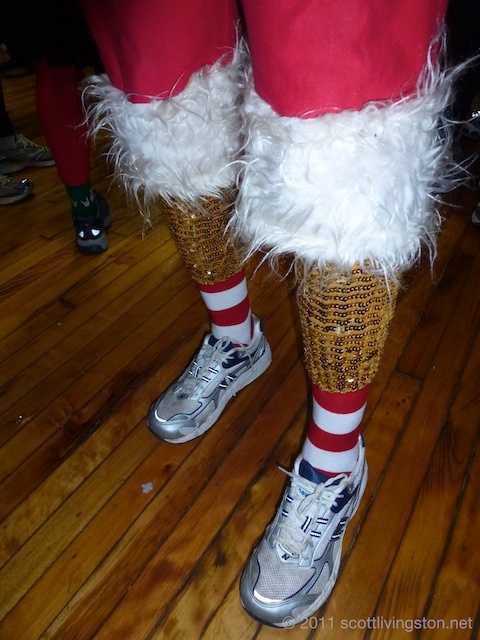 Many people get into the holiday spirit by running in costume. Some are outlandish. The current residents of the shelter were all smiles and offered many hearty cheers to the runners. It was nice that so many runners find it in their hearts to contribute to this race. No entry fee is specified, but judging from the haul, people were very generous with their contributions. 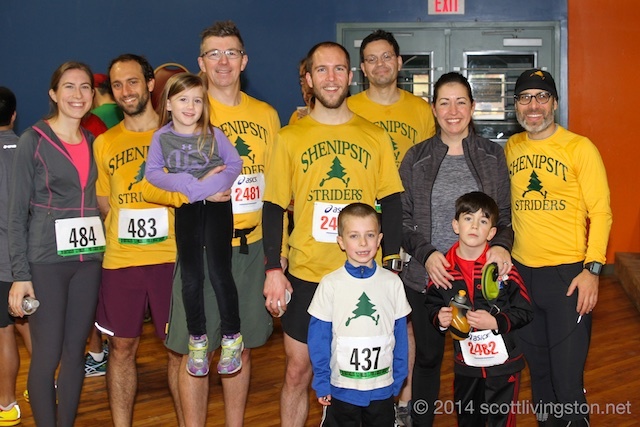 The Shenipsit Striders and Silk City Striders were well represented. 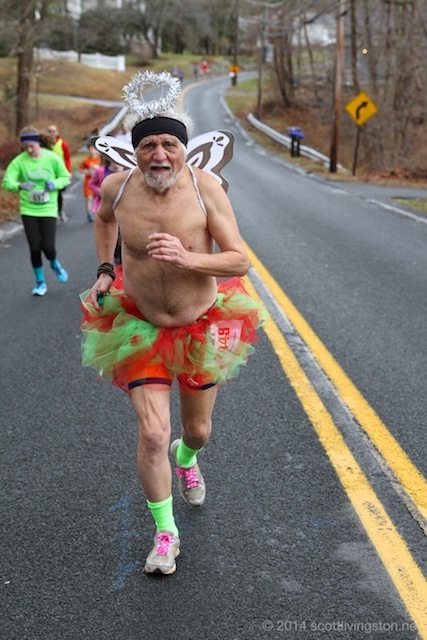 As long as we are in Connecticut for Christmas, we will run this race. It was a wonderful final race of 2011. It was my 36th event. I’ll look back later this week when I put closure on 2011 and start locking in the goals for 2012. 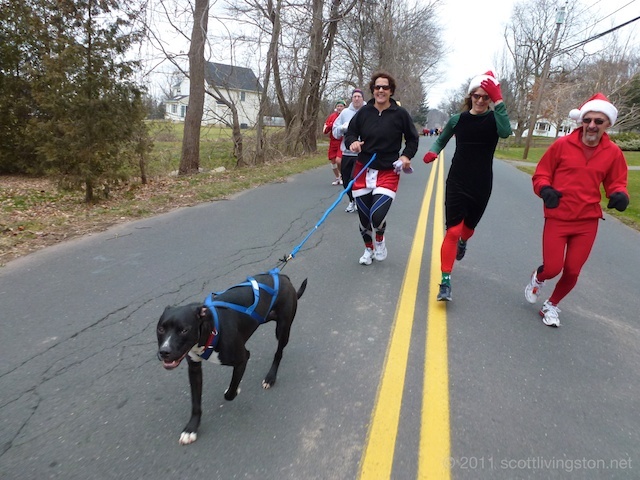 Today, Debbie, the kids, and I did the Santa’s Run in Glastonbury, Connecticut. We’ve run this 3.5 mile road race many times. It’s one of the more chaotic races that we do. More than 1,500 people ran or walked today’s race and that’s more than the course can handle. The start is one of the more interesting one’s in the area. If you fall, you’re going to get stampeded. Everyone is jammed in between two curbs on a narrow road that starts on a downhill. Everyone wants to start in the front row, even the 8 year-old’s. I don’t blame them, but every year, there is concern that someone is going to get trampled. This year, they encouraged people to self-seed, but I don’t think it worked. I started last today. They went to chip in the bib-number timing and added a mat at the start line. Last year, I was able to run with the Chariot CX-2 by “cheating.” I started 50 feet in front of the line where I was stationed in someone’s driveway. This year, since I had to cross the mat to get scored, my strategy wouldn’t work. If you can’t get the hole shot, you are stuck behind a lot of people. Plan B: I was hoping to just wait to cross the start line until everyone got down the hill so that my “net time” would be more reflective of the effort. The “gun time” i the official time, but every runner know stat when you are trash talking with your buddies and sharing war stories, that it is “net time” that matters! After all, it might take you 3 seconds to cross the start line and that could be a huge disadvantage! Well, the organizers didn’t like my Plan B strategy. As soon as everyone but me had crossed the start line (I was just standing there in the road with the stroller), they threatened to “pack it up.” I think the timer actually said, “I’m not staying here all day. Get moving.” So I just ran for fun and let Debbie race. The whole episode was kind of funny. I was forced to start a race or get disqualified. I have to say that is the first time that has happened to me! I might have been the first person to be at the start line but get a DNS and DNF simultaneously. My kids were confused as to why I wasn’t moving. I used a few sidewalks to get past the throngs, but it was fruitless. I chilled out and just ran for fun, saying hello to everyone I knew in the crowd. 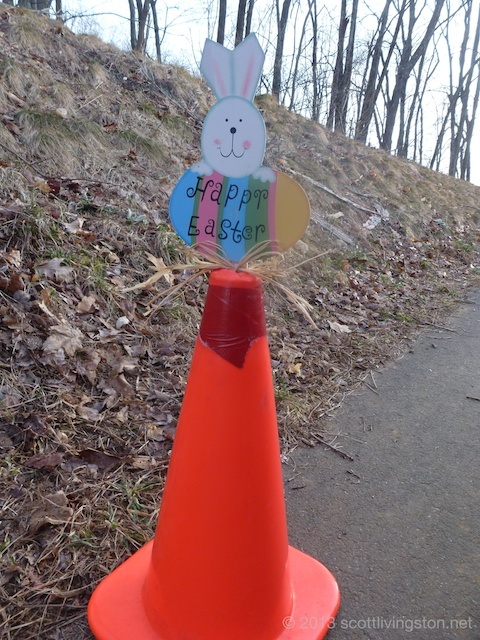 Between the warmup, race, and warm down, we did three loops of the course, which frustrated our 5-year old. He is a sport for letting us do this stuff, but it didn’t take that long. We do appreciate his whining. There are probably worse things that parents could do to their kids, than run a little longer on a Sunday. Debbie had a great race, but their fancy chip timing system didn’t work. I don’t know how many people are missing from the results, but she is one of them, which is a disappointment. She had a great battle with her friend, Allie Burdick. She had a back and forth race with Allie and just got past her in the final stretch. Debbie should have been 3rd overall and 1st in her age group, but it looks like she didn’t run at all. She ran much faster than 2011, so she was pleased. We got a double bummer when we returned home and learned that her name was not picked in the 2012 Hardrock 100 lottery. Only 100 out of 600+ get in. It’s not worth explaining the complicated Hardrock lottery. The bottom line is that she wanted to run the famous Colorado race and now has to find something else epic to do instead. She will try again in the future, but once again, she needs to run one of the qualifying races just to get a lottery ticket. The Grindstone 100 was her 2012 qualifier, but who knows if she will return to Grindstone or find something else to do. Anyway, the Santa’s Run was a fun time with the kids. We already discussed 2012. If we return, rather than battle the crowds, we might just enter the costume contest instead. Sami Inkinen is a very talented triathlete and a fellow member of www.ypo.org. We have compared notes on training in the past and had a chance to meet at the Ironman World Championship in Kona, Hawaii in October 2010. He returned to Hawaii in 2011 and absolutely crushed it, knocking an hour off of his 2010 time. He did have a sub-9 at the 2010 Ironman Arizona, but Hawaii is a much more difficult race. His sub-9 hour time at the world championship made him runner-up in his age group and top 40 overall. It was a stellar performance from someone who achieves at a high level in both business and sport. He is even more focused with his training than I am, but we both agree that less is more. Sometimes, I just want to be outside and ignore any rules. If I want to run for three hours in the woods, and I have the time, then I do it. Truthfully, that is when I have some of my most fun workouts. My triathlon specific training isn’t very specific at all. I love commuting to work, whether it is by bike or on foot. When I ride, it is a minimum of 14 miles each way, depending on the route. When I run, it is 17 miles with the first 8 on the Hop River Rail Trail. I only go one way when I run. I spot a vehicle the day before, ride home, run in, and then drive home. I’ve got to go to work anyway, so I make the most of my time by getting there with my legs. I build much of my training around the commuting. If I’m aiming for peak performance (sometimes I just exercise for fun, fitness, and stress reduction), I pay attention to time/distance/heart rate, but I don’t use a cyclometer and I wouldn’t even know what to do with a power meter if I saw one. So, when Sami talks watts, I’m lost. I’m sure I could improve performance if I paid attention to that sort of thing, but I just can’t be bothered. I like to use “feel” because that is how I learned to do endurance sports 25 years ago and it has mostly worked. Sami has a brilliant post on his blog from earlier this week that is getting circulation around the Internet. His sub-9 last weekend was the crowning achievement of his season, but his age group world championship at the Ironman 70.3 Las Vegas race in September is equally as impressive. He may train a bit more than me, but I probably race more than him, which is what I like to do. 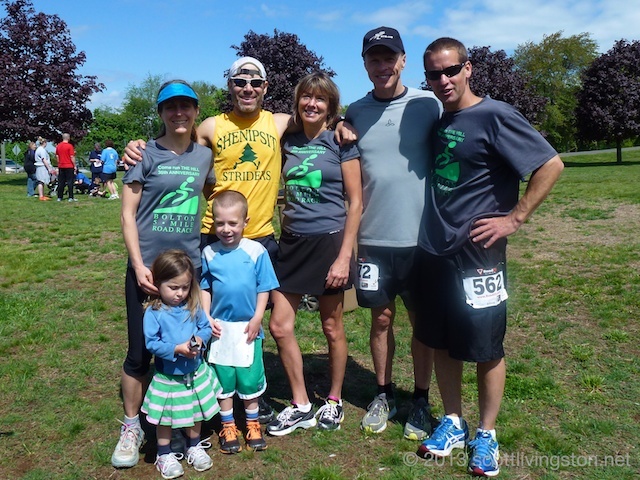 I have the added challenge of having two children who I spend a lot of time with, and I need to support my spouse, Debbie, with her ultramarathon trail running. Both Sami and I manage small/mid-sized businesses with significant leadership responsibilities. 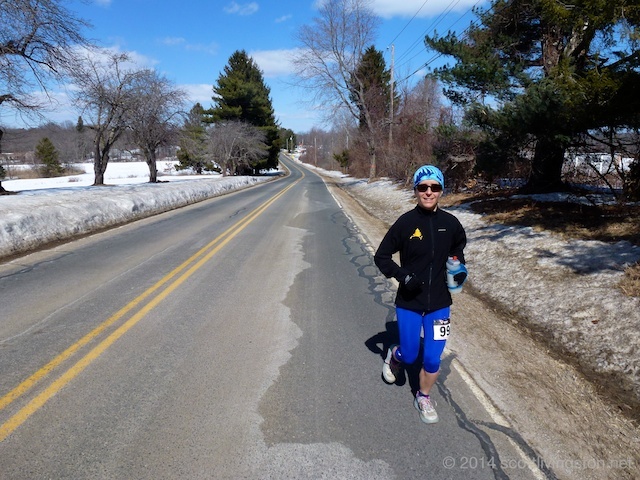 After I read Sami’s post, I reflected on the three years since I started doing triathlons. I have a cross-country running, road cycling, mountain biking, cyclocross, and trail running background and just started swimming in 2009. I didn’t go sub-9 in Kona like Sami. He clearly has immense natural talent and a body type that is suited to endurance sports. I would love to have his power and strength. However, a triathlete can still get improved relative performance with his approach. I have been modestly successful with long course triathlon and qualified for the 2010 Ironman World Championship with a 9:58:53 at Ironman Brasil. Sub-10 was my goal and I got it. My time in Hawaii was 10:27:31 on a tough day where I got a really bad sunburn on the bike leg. My fastest half is 4:37:35 at Timberman 70.3. I hope to go quicker at that distance and would need even better quality training to do so. I’m pretty happy with my short course biking and running, but to improve overall (mostly sprints on road and off-road), I need to develop stronger swimming technique. Both Debbie and I do a fair amount of training with our Chariot’s (CX-1 and CX-2) with our kids. We run a lot with it in jog stroller mode, and I occasionally pull it in trailer mode. When I’m really busy with work and family, I find that my focused training slips and I get more junk miles, but that still works for stress reduction and basic fitness. I didn’t do a long course triathlon in 2011 and I’m not sure if I’ll do one in 2012. I needed a break from Ironman. Right now, Debbie’s training and events take precedence over mine. I’m searching for some new and interesting stuff and I’m just mixing it up again while enjoying more time on trails. Last year, when I was trying to qualify for Hawaii, I tried to average 10 hours a week of exercise. I fell short by a little. The winter months are hard and I don’t do much indoor training. I only use rollers and I’ll occasionally run on a treadmill, but prefer to be outside regardless of the conditions. In the build period before my A races, including Brasil, I did get 10-12 hours for several weeks at a time. I kept a simple spreadsheet log and always aimed for 600 minutes of quality activity. Again, I loosely define quality because I probably still had too many easy workouts with commuting and with the kids. I raced less and trained more with intervals. Unlike Sami, I did do a few brick workouts in 2010, but didn’t do any in 2011 because I did enough races. Most of my running is on trails. I have an eclectic mix of events that I enjoy and I don’t obsess about the diversity. Avoiding roads, except for races, and the occasional jog stroller run, is a great way to avoid injury. My worst injuries in recent years have come from hard crashes, falls, and the pounding of certain events. I believe that my diversity and cross training keep me injury free. I’ve had niggling little issues like some plantar fasciitis in my left foot, but nothing has sidelined me or kept me from a workout or race. In addition to a steady, but relatively light training schedule, I have a vegan diet and I get solid sleep. These two habits have made a huge difference for me. Other than energy drinks during races, and the occasional beer or glass of wine, I don’t consume any calories from liquids. By eating only plants, I have an incredibly lean diet that is rich in nutrients. My eating vice would be chips and salsa. We don’t have a television and you would be amazed how much time that frees up. Lately, I’ve spent a bit too much time in the evenings on the Internet, but writing is a hobby. I go to bed early so that I can get up early. Most of my workouts are in the early morning. I’m at work by 7:15 A.M. every day, so I don’t have much time and often train in the dark and cold. The best days are when I commute by bike and I can get two short rides. Another athlete who has done more with less is Troy Jacobson. He is the official Ironman coach and offers a myriad of training plans. I haven’t read anything about his coaching business or client training strategy, but his personal approach helped him record a great finish (9:22) last weekend. He also used a 10-12 hour/week plan. His blog post is also worth reading. Many fellow triathletes are surprised when the learn that I train less than them. I espouse that when you are busy and can’t find the time, you make the most of it. Sami’s final paragraph is my favorite when he refers back to the business world. The same lean approach that he promotes for triathlon training should be applied to business and management if you want to yield better results. Try it.